Dimensions: 350mm x 310mm x 75mm. 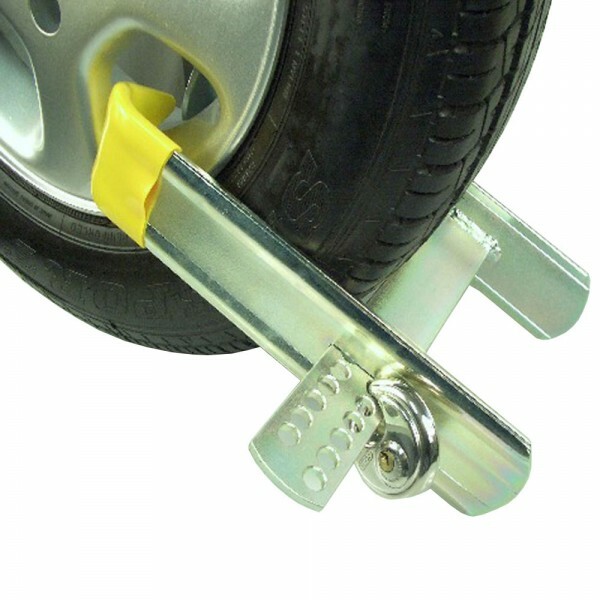 Versatile clamp for securing caravans, trailers, cars, vans and 4X4's. Multi-fit holes, adjustable upto a maximum tyre width of 255mm. Complete with hardened shackle stainless steel padlock. Inner arm protrudes deep into rear of wheel to fit between rim and brake disc/drum. Plastic sleeved end to protect wheel. Manufactured from 75 x 6 mild steel. Zinc plated finish. British manufactured and sold with Bulldog 5 year Guarantee. NOTE: Sizes quoted are as supplied by manufacturer- please check against actual tyre markings before ordering.